A group of Goffin's cockatoos just impressed the hell out of researchers from Oxford after they picked their way through a series of five complex locks to reach a reward. Birds have extraordinary intelligence and have proven to be exemplary problem-solvers. They've been known to make their own tools, exhibit the reasoning skills of toddlers, and even steal and hide precious items. They've also got their own version of a neocortex. And we can now add a new item to the list: lockpickers. Or as the scientists like to say, they're "sequential problem solvers." 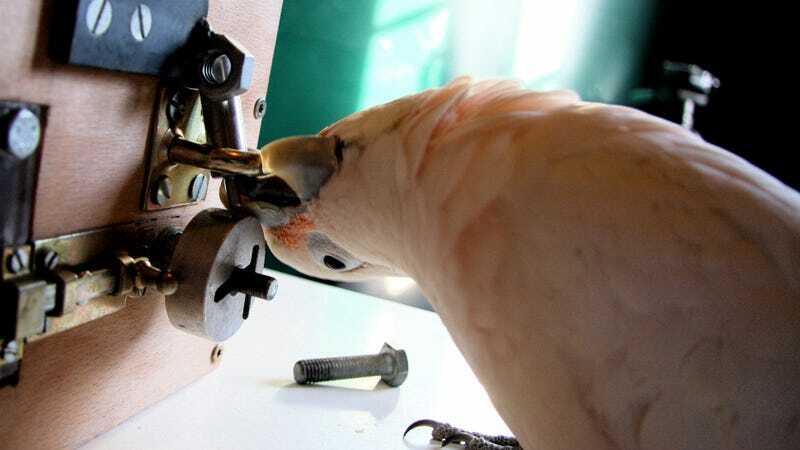 To unlock it, the cockatoos had to remove a pin, followed by a screw, a bolt, then turn a wheel and move a latch sideways. Most of the birds were able to figure it out after observing other cockatoos, or being presented with the locks incrementally. But one cockatoo, Pipin, solved the puzzle in two hours — completely unassisted. The scientists also tested the cockatoos by mixing up the lock sequence. The birds were unfazed by the change, working on the new first step to unlock the box instead of applying the previously learned technique. Some interestingly takeaways from this study include the observation that the cockatoos' progress was unaffected by the fact that the goal was very distant, and that they're capable of innovating new sequences without further trial. We cannot prove that the birds understand the physical structure of the problem as an adult human would, but we can infer from their behaviour that they are sensitive to how objects act on each other. We are not saying one way or another whether this species is particularly smart. That is not our message. It would be too easy to say that the cockatoos understand the problem, but this claim will be justified when we can reproduce the details of the animals' response to a large [range] of novel problems. Okay, sure — fair enough. Further experimental rigor is most certainly warranted. But it's likewise important to not understate the achievements of these birds, and what we might able to infer about their cognitive capacities — and just how much they truly understand the situation. Read the entire study at PLOS: "Explorative Learning and Functional Inferences on a Five-Step Means-Means-End Problem in Goffin’s Cockatoos (Cacatua goffini)." Top image: Oxford University/Alice Auersperg.